Landscaping can be pricey, but there are ways to lessen the expense if you exert a bit of extra effort and some ingenuity. Here are our favorite ways to landscape on a budget. 1. Choose plants with bright colored blooms for big impact. Flowering plants with big, bright blooms (as shown in the first image above) help fill space and draw the eye in. Look for colors that complement or offset the shades of your home's siding or stucco. Rather than buying brick or other garden border materials, find stones for free and use them to create an attractive divider between the garden and the lawn. 3. Instead of buying 5 plants, buy one and divide it. Divide plants, like hostas or lillies, and spread them throughout your yard. You'll save money by turning one plant into several. Dividing plants is pretty easy; just dig up the entire plant, making sure to keep the root-ball intact. Then carefully split up the roots and stems until you have separated the plant into several chunks. Each group can be re-planted, and should continue to grow if watered and maintained appropriately. Read more here. Ask your neighbor if you can take a few cuttings from their rose bushes, then use this tutorial to learn how to propagate them. Learn to compost! Put garden and kitchen waste to good use and help add important nutrients back into your topsoil. Learn more here. Curbly Tip: Compost starter is extremely useful. 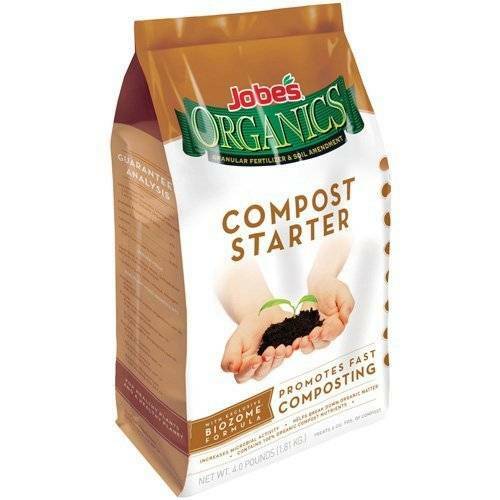 We like Jobe's Organic Compost Starter because it's inexpensive and gets great reviews. 6. 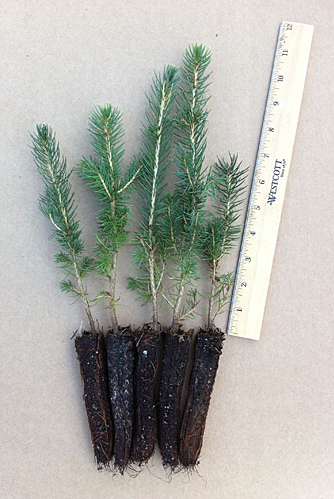 Buy evergreen seedlings instead of larger potted trees. Seedlings will take a bit longer to grow, but they're much less expensive. Use this tutorial to find out how to make a rolling raised garden bed out of a couple of wooden pallets. Wooden crates can be turned into planters! Tool sharing is a gray way to save money. Rent a wood chippers or soil aerator, and split the costs with friends. You can also split seed packs, plant packs, and more. 9. Buy pots and planters used or on sale. Yard sales, flea markets, and Craigslist are all great resources for finding really affordable pots and plant containers. 10. Construct a rain barrel to collect rain to water your garden and lawn. This will lower your water bills (and help the environment too!). Get the rain barrel tutorial here. Use a downspout adapter to direct water flow. Painting bricks can add a pop of color and style. 11. Add some color by painting rocks, bricks, or landscaping pavers. You know how sometimes you just get tired of looking at boring, plain, red bricks? Well, guess what? Other people do to! Which is why those materials can often be found for cheap, or free. But with a fresh coat of paint, you can turn them into something special. Try painting river rocks white for a clean, modern-looking ground cover option. Or add pops of bright color to an old brick wall. Here's a good primer on how to correctly paint these type of materials so that the top coat will last. Wood shipping pallets can be found for free almost anytime (or bought for cheap). Look for them by the side of the road, or at warehouse loading docks (make sure to ask before you take them; usually people will be happy to let you have them). 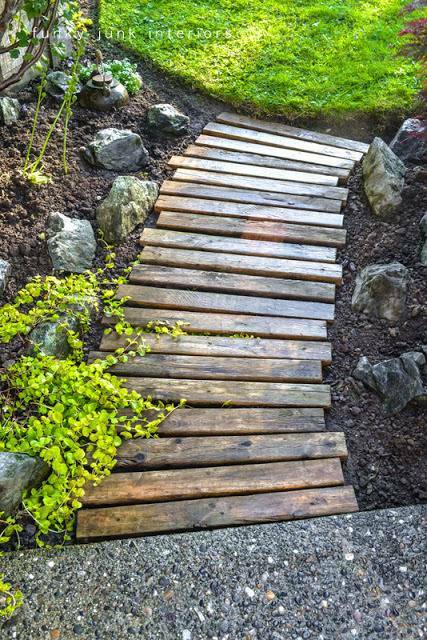 These wood structures are built to be used outside, and can easily be turned into simple pathways (as above) or other outdoor landscaping features. 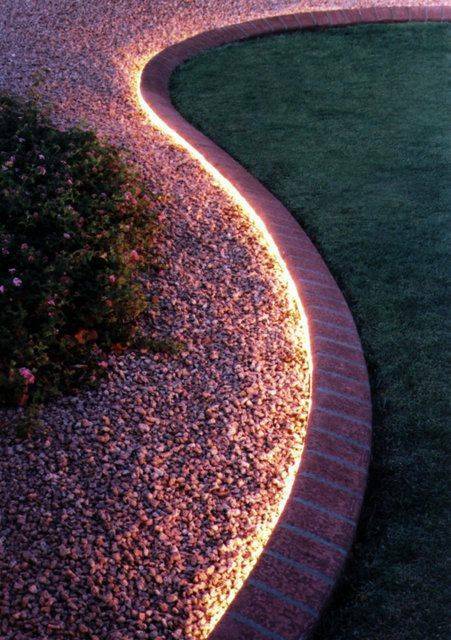 Simple, carefully-placed lighting can make even the most ordinary yard look amazing. And the best thing? Lights have gotten really affordable over the last ten years, thanks in part to the advancement of LED technology. In many cases, you may not even need additional electrical wiring, because LEDs use such little electricity that they can be solar powers. Try a rope light along the edge of a garden, or spot lights to feature large plants or trees. Check out our other landscaping and gardening posts here! This post was originally published in May 2015, but we've updated it with new information for this year. All good tips! Thank you. Glad these tips were helpful for you Erin! Landscaping is what's next in my home project. And I am looking for great ideas now but of course, I am considering the budget also. Thanks for sharing these ideas. It's a great help to me.